CFEngine is a highly scalable configuration management tool for various works. Here is How To Install CFEngine on Ubuntu 14.04 HP Cloud. CFEngine has a community edition that is free to use. There is dedicated website of CFEngine, where you will get details about the software, if you have heard or used cloud automation tool like Puppet or Chef, CFEngine quite similar but smaller in size. This guide is intended for the advanced users only. You can cURL or wget the above file from server from our gist here. 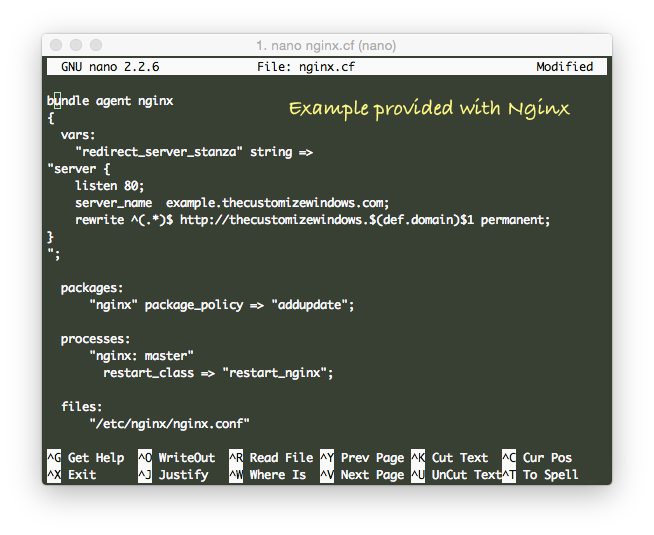 even if change nginx, CFEngine will automatically run it again. It is kind of auto firing. This Article Has Been Shared 3275 Times! Cite this article as: Abhishek Ghosh, "Install CFEngine on Ubuntu 14.04 HP Cloud," in The Customize Windows, July 24, 2015, April 23, 2019, https://thecustomizewindows.com/2015/07/install-cfengine-on-ubuntu-14-04-hp-cloud/.